Botox is one of the safest treatments used to mask some of the more common signs of aging, such as wrinkles, laughter lines, and ‘crow’s feet’. Here, we’ll answer all your questions relating to Botox. What is a Botox treatment? A Botox procedure involves the quick and mostly pain-free injection of the Botulinum toxin directly into your muscles. It works to block the chemical transmissions that take place between the nerve and muscle, allowing the facial muscles to relax. This can significantly reduce fine lines and wrinkles. Toxins are substances that trigger an immune response in the body. For example, the body may attempt to protect itself by shutting down some essential functions, which can sometimes be dangerous. However, when the Botulinum toxin is delivered in low doses during a Botox procedure, it is possible to experience the benefits of the toxin — the shutting down of the communication network between the nerve and the muscle — without causing harm to the body. Botox is considered to be a safe treatment. The most common use of Botox for aesthetic purposes is to relax the muscles in the face to minimise the appearance of wrinkles and hide the classic signs of aging. 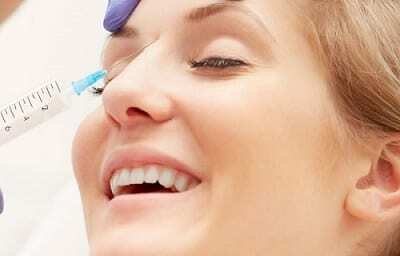 Botox can be injected into the upper forehead region, or around the mouth to reduce laughter lines. However, there are actually many other uses of Botox. It can be used to treat overactive muscles that can cause a ‘gummy’ smile, and can even be used to weaken the chewing muscles to reduce the jawline and add a softer touch to prominent, square jaws. Botox is widely considered to be a safe treatment, and severe side effects are very rare. However, many patients will experience a slight bump and mild redness at the injection sites, which usually disappear after around 1 hour. These side effects will be discussed during the consultation prior to any treatment. You should begin to notice the treatment starting to take effect around 2 or 3 days following the procedure, with the muscle becoming fully relaxed after about 2 weeks. The results that you experience can last up to 6 months, at which point you may begin to feel the muscle start to move more freely. The cost of Botox treatments varies, but here at Medical Cosmetics we strive to offer highly competitive prices for all of our professional procedures. Botox treatments in Nottingham begin at £129. Don’t hesitate to get in touch with the team here at Medical Cosmetics for more information on Botox pricing.